Walter Ritchie Clarke had been in the militia since he was 13, when he joined the York Regiment in New Brunswick as a bugler in 1905. By the time of his enlistment with the CEF in 1916, Clarke was married with a daughter, and had been serving as an orderly room sergeant for the first two years of the war. 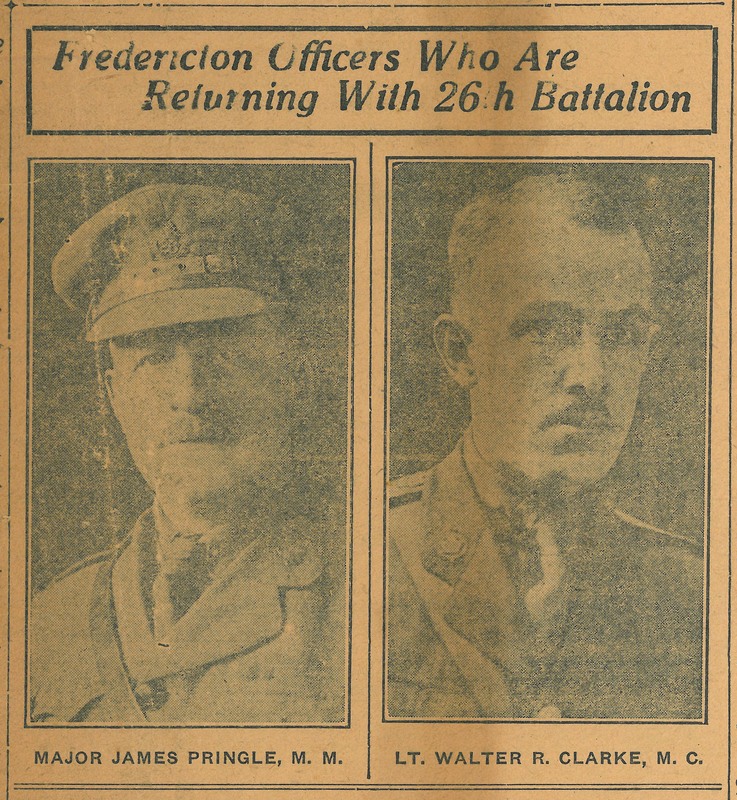 He came directly into the CEF as an officer and was soon sent overseas with a draft of men meant for New Brunswick’s frontline battalion, the Fighting 26th. By the time Clarke joined the battalion in November 1917 it had already made a name for itself as part of the 2nd Division. Raised in 1914, the 26th Battalion’s first taste of frontline action was at Saint Eloi in the spring of 1916, when they were called upon to provide support for the rest of the beleaguered 2nd Division as it struggled to defend and hold the craters in the area against almost continual German attacks. The battalion went on to fight at Mount Sorrel two months later and distinguished itself at Vimy Ridge in the spring of 1917. Clarke joined the battalion fresh out of Passchendaele, where they had participated in taking the village, officially ending the 3-month battle that had consumed so many soldiers on both sides. Lt Walter Clarke’s big moment with the 26th Battalion would arrive in October 1918, after they had fought their way from Amiens on 8 August through to the D-Q Line in later September. Miraculously, when casualties were running high (these two months cost the Canadian Corps over 25 000 dead and wounded), and even higher for officers, Clarke was still uninjured. It was as the battalion was readying to attack at Cambrai on the night of 6 October that Clarke was given his “suicide job”, as Col. A. L. Barry called it in an article written for the North Shore Leader over 45 years later. The 26th Battalion was given the Canal de l’Escaut as its objective; the attack would take place on the night of 8 October, the canal bank would have to be secured, bridges repaired, and the far bank secured, all under total darkness. Lt. Clarke’s platoon was given the unenviable task of escorting the engineers forward to check the bridges crossing the canal. The party soon came under fire and Clarke and his men fought a dogged battle to allow the engineers to secure the bridge, making it safe for the battalion to cross. According to Clarke, he went in with 28 men and came out with 8. For his role in the successful crossing, Lt. Clarke received the Military Cross. Apparently, he was originally recommended for the Victoria Cross, but insisted that the recommendation be given instead to the engineer leading the party, Captain Coulson Norman Mitchell, though this is most probably apocryphal. Captain Mitchell did in fact receive the VC, the only engineer to do so. He later moved to Montreal and is buried in Pointe-Claire. For his part, Lt. Clarke continued through the last days of the war with the 26th Battalion and was with them when the battalion entered Germany in December 1919. He returned to New Brunswick in 1919 and began a long career with the Fraser Companies that ended with his retirement in the 1950s. Clarke was eventually named Lt-Col. of the 2nd Battalion, Carleton & York Regiment, serving during the Second World War, and later served as Governor General Georges Vanier’s aide-de-camp. All told, Walter Ritchie Clarke’s military career spanned 55 years, not bad for a man sent on a suicide job! Thank u for this article. My family appreciates it. Our pleasure Natalie, it’s always great when our blogs find a family connection!